A pale, slightly hazy Bière de saison Belgian ale with coriander, orange peel and grains of paradise. With a fruit bowl aroma from the Sorachi Ace hops with a hint of tangerine fruit, spice and a pinch of lemon pepper. Crisp and refreshing with a bone dry finish. Ooh, in off the bar! 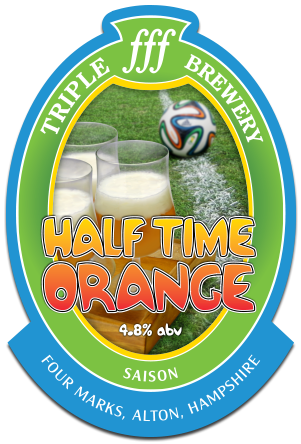 Just like to congratulate you on the ‘Half time Orange’ we had a supreme pint from the Keg at the Butchers Ale House, last night. So good we might pop back today! Our favourite beer of the year, many of these type of beers are too obvious in their flavouring, yours is just perfect.